Montreal is one of the most complex cities I have ever visited. It is culturally rich, steeped in history, and ground zero for French-English bi-culturalism and its attendant debates. It is also an industrial port, forged by its strategic location on the St. Lawrence river. It’s modern and international yet traditional and insular. The beautiful and ugly co-exist in single perspective views of Montreal as in few other places. I have been to Montreal 5-6 times in my life and three times within the past two years with Heather. Our recent sojourns were driven by initial curiosity about the poker scene after seeing the Playground Poker Club on a televised tournament. 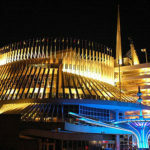 It turns out that the Casino Montreal also has a decent poker room. Enjoying both, and the fact that Montreal is only a 5 hour drive from our house, we have returned twice in the summer and most recently over the New Year’s weekend. However, I must admit I am still divided on Montreal as a vacation destination. Let’s start with the positives. Much like New Orleans, Montreal’s food scene is a key component of its desirability. I develop an instant chocolate croissant addiction as soon as I enter the city limits. The Boulangerie Premier Moisson in the Gare Central underground is my go-to supplier. Premier Moisson is a chain with 13 locations throughout Montreal, so you should be able to find one nearby wherever you find yourself downtown. The city is replete with good quick lunch options as well, including a couple of places in the Gare Central and several in Old Montreal. Things really get exciting as dinner approaches. Nothing feels more decadent than fondue. 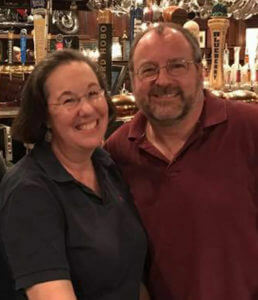 Heather and I had a great fondue meal at Creperie Chez Suzette in Old Town last summer for a pretty reasonable cost. As a bonus, we sat on the patio and watched the crowd wander by as we ate. This winter we had a great Mexican tapas style dinner at Escondite. Escondite has a bar and about 15 tables, and the small space makes it a bit cramped. But that is a small price to pay for the fabulous food. We started with guacamole, jalapeno cornbread, and their “amaizing corn esquite” from their tapas/appetizer menu. Then we had two different types of chicken tacos: the mole and the big winner the Pollos Hermanos, a deep fried chicken with chipotle crema. Five tapas courses with tax and tip ran us about $40 US dollars. One of the greatest value meals I have ever had. The Plateau Mont-Royal district is also filled with great shopping and dining options. We ate at La Raclette at the end of December. We had a good solid three course meal that warmed us up on a cold winter night. I’m a stick to a hotel you love kind of guy. 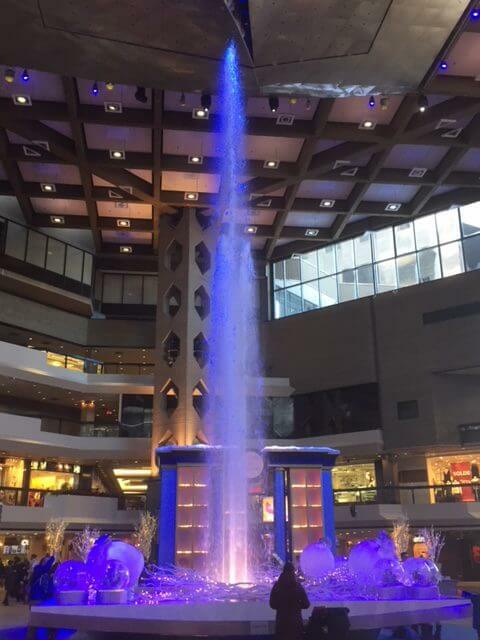 So I can write about exactly one Montreal hotel: the Hotel Bonaventure. It’s website describes it as “an urban oasis.” I can think of no better descriptor. Sitting atop the Place de Bonaventure, this hotel rises above Montreal occupying its own unique space. The rooftop is replete with rooftop gardens and waterways speckled by various species of ducks. Sitting and reading amid the gardens in good weather is the best of escapism. 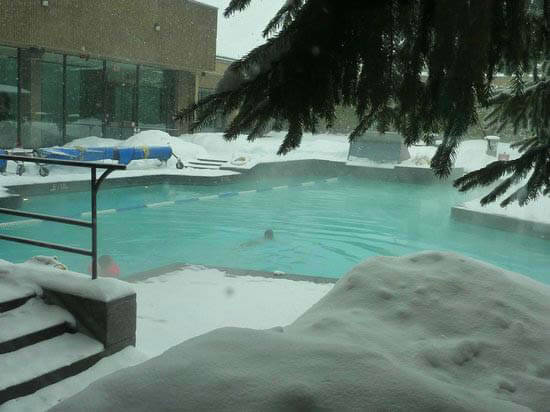 The year-round outdoor heated pool is a challenge worth taking even in the depths of the chilly Montreal winter. The ice forming around your head as your body moves through the warm pool is a unique and exhilarating experience. Despite having nearly 400 rooms, we have never felt an overwhelming crush of people even when it is clear the Bonaventure is fully booked. Easy access to the Montreal underground and Metro is a lifesaver in the winter, and the hotel’s central location makes getting around pretty easy. Rooms have plenty of space to spread out, and comfortable beds. 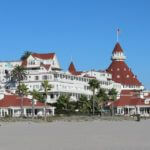 The showers are a bit finicky, making it hard to find that sweet spot between scalding and lukewarm, but that’s a small price to pay for such a fabulous hotel. Heather and I had explored the underground a bit in previous visits, but the sub zero cold drove us to maximize our use of the underground this past visit. We’re glad we did. We walked in both primary directions from the Place Bonaventure. The walk to the Museum of Contemporary Art was particularly fun, taking us through several interesting buildings replete with artistic installations. Finishing our journey with a stunning exhibit/tribute to Montreal native Leonard Cohen at the museum was the cherry on the sundae! Driving in Montreal made me long to drive in Boston. For anyone who has driven in Boston, I need say no more. 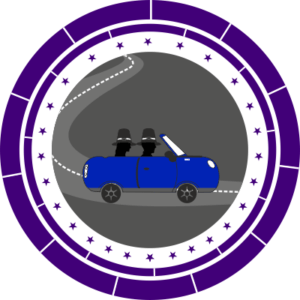 The roads offer unexpected twists and turns with ambiguous signage and pot holes that form in front of you as you go. Driving in Montreal feels like you are Katniss Everdeen making her way through the war ravaged Capitol in The Hunger Games. The bridges in particular are ravaged and decaying and frankly a bit terrifying to cross. The weather is tough up there, not really Montreal’s fault, but it is a challenge to navigate. Prior to the the New Year’s trip, we of course looked at the weather reports. A cold snap was descending on the Northeast, so we expected low temperatures. However, when I looked up the Montreal predictions, my first thought was “this must be in Celsius.” No, it turns out, that -5 degrees as a high, yes a high, for our five days there, was good old sub-zero Fahrenheit . The view of Montreal is much better at street level. When you drive around the main thoroughfares of the city, the industrial aspects and infrastructure deterioration mar the overall aesthetic. The architecture of the downtown area also lacks the sleek modernism of Toronto or the old European feel of Quebec City. 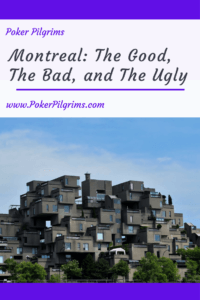 Several of the taller buildings (limited in height by code to be below the height of Mont Royal) were built in the utilitarian era of the early 1960s, an era that has saddled many North American cities with regrettable structures. 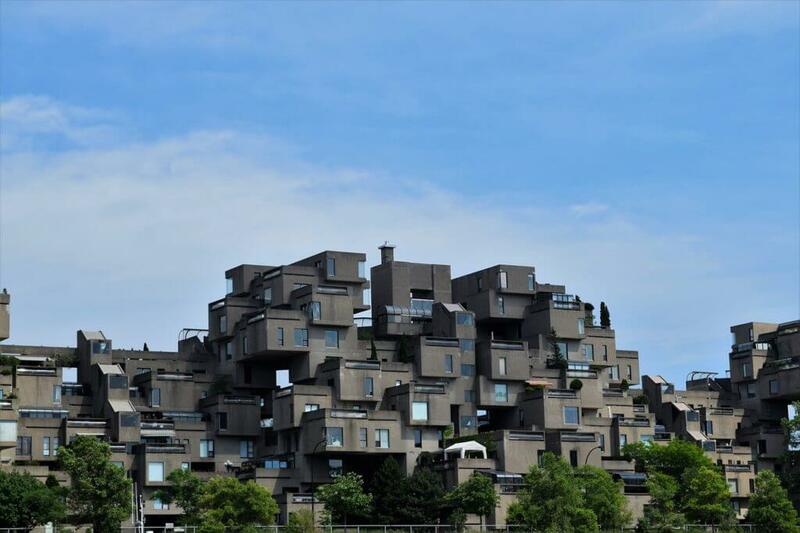 The Brutalist movement added several other buildings, most famously Habitat 67 built for the 1967 World’s Fair. 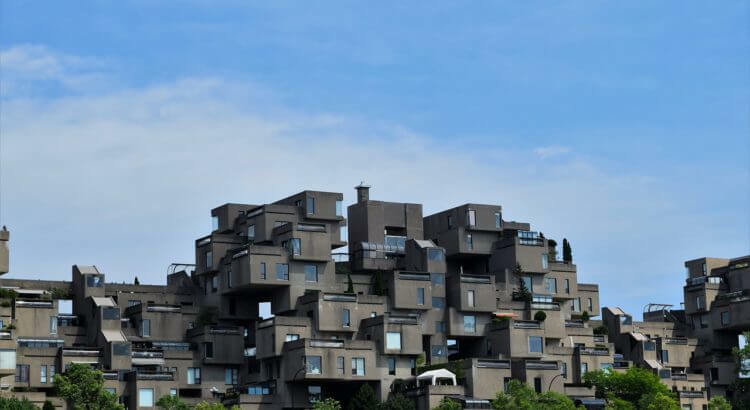 The sharp divide on Brutalism will likely never die (see debates about Boston’s City Hall), but certainly even adherents would not describe it as “pretty.” Montreal is just not a pretty city. As I write this, I must admit that my affection for Montreal continues to grow. And looking back, I think my affection has increased with each visit. After all, there must be a reason I returned for my third visit in two years. I think there are many beautiful areas in Montreal. The street art always lures me and is both amazing and plentiful. Old Montreal is adorable and makes me feel like I’m in Europe. The colored buildings at night add an artistic flair that I really enjoy. I am in love with Montreal. I would love to visit Quebec, I went once over 25 years ago but really didn’t see much. Quebec is amazing. A large section of Quebec is like old Montreal. It is very European and French is even more primary there than in Montreal. We visited a couple of summers ago and had a wonderful time. I’ve also been there in winter (albeit 20 years ago) and Quebec is amazing in winter as well. So many things to do and see at that time of year. Highly recommend it. It’s about a 7 hour drive from Massachusetts. We spent a night in Sherbrooke on the waay up which is east of Montreal and another lovely town to visit.